Here is my weekly look at what I saw from NFL Sunday. As usual, a reminder that IÃ¢â‚¬â„¢m basically a football layman, and IÃ¢â‚¬â„¢ll also point out that I observed less than usual due to watching National LampoonÃ¢â‚¬â„¢s Christmas Vacation, possibly the greatest movie of all time, on Sunday. 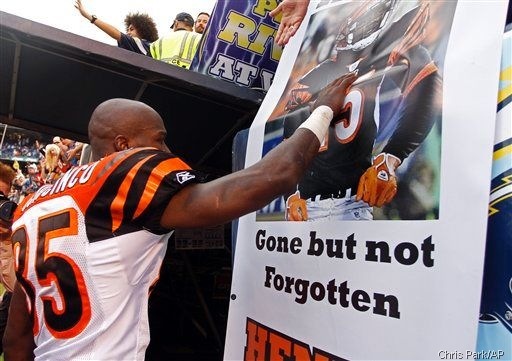 As just about everyone did, I considered the death of Chris Henry to be a real shame. Obviously, Henry had something of a checkered past, but from all accounts was attempting to get his head on straight and his life in order, something all of us can appreciate. Being on injured reserve and away from his team, he lapsed in his decision-making at the worst possible time. Maybe thatÃ¢â‚¬â„¢s why I found it especially touching to see the efforts of Chad Ochocinco and Brandon Marshall, two other quirky Ã¢â‚¬â€œ to say the least Ã¢â‚¬â€œ wide receivers, to pay tribute to their fallen comrade.